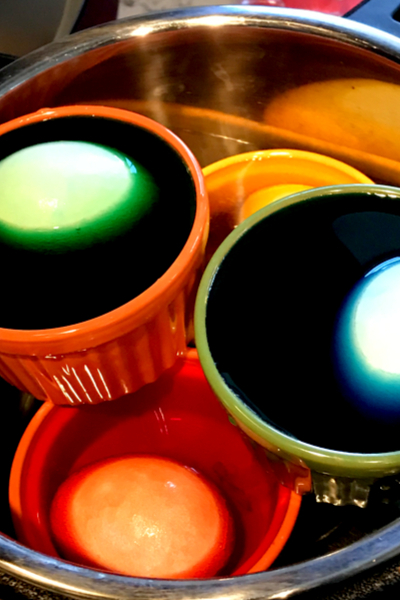 Yes, it is true…you can make colored Easter eggs in the Instant Pot! Earlier this week I was asked if I would help dye Easter Eggs for a community Easter Egg hunt. Easter eggs colored in the Instant Pot! Wanting to volunteer, I quickly agreed that this was something that I could help with. However, I had one large dilemma – time! You see, when we color Eater eggs in our house, I typically dye them using natural ingredients. By natural, I don’t mean with food dye and vinegar. And no, the tablets that you dissolve don’t count either. Instead, I boil down fruits, vegetables, and even use coffee grounds to make the colored water. This method of coloring Easter Eggs uses food dye. I then add the vinegar to the each shade of water and soak the eggs until they become a variety of brilliant colors. However, this process takes a while to prepare. You have to boil down each individual item seperately. And for this event, I didn’t have the extra time it takes to color the Easter eggs using the natural method. However, I wanted to help so I turned to the old-fashioned food coloring method. Because these eggs were going to be used for an Easter egg hunt, and not being consumed afterwards, I felt comfortable coloring them with food coloring. 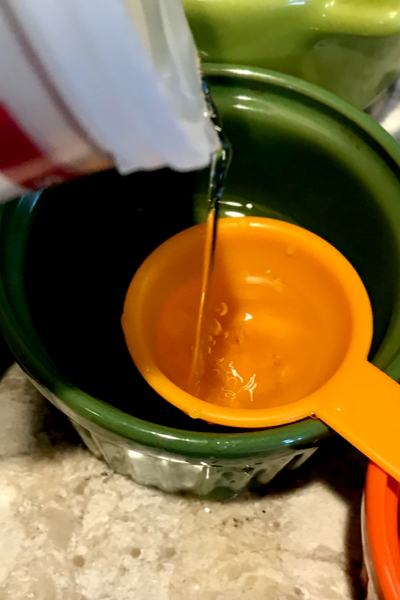 Apple cider vinegar makes the colors pop better than distilled white vinegar. There is a lot of controversy regarding the ingredients in food coloring and if it is safe to be consumed. We won’t get in all the details here, however, because the eggs were solely going to be used for an Easter egg hunt, I had nothing to worry about. So I bought one of the 4 packs of food coloring at the grocery store and got to work. My first thought was to make Instant Pot Hard Boiled Eggs and dye them in individual cups afterwards. 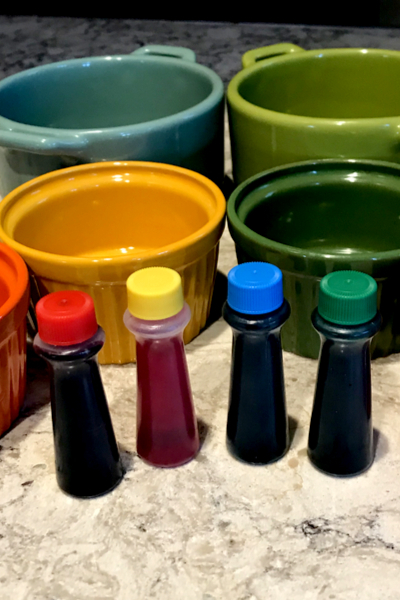 Ramekins filled with vinegar and food coloring. Seemed like an obvious choice. However, I wanted to take it one step further to see if the Instant Pot could actually color the eggs while they are being cooked! So instead, I pulled out my oven safe ramekins and decided to give it a try! I mixed vinegar and food coloring in the bottom of each dish. Next I added the egg and covered it with water. It is okay to stack the ramekins, and even though the eggs aren’t completely submerged, they turned out okay. My ramekins are on the smaller side, so the egg wasn’t completely covered. I was worried that with part of the egg sticking out, it would leave a strange white oval. But it was all I had to work with in a short amount of time. Plus, I could always say that it was a creative design! So I stacked my ramekins on the trivet of the Instant Pot and cooked my eggs like I normally do. You can even color several eggs in the same color. 5 minutes under pressure, 5 minutes waiting after cooking, and then 5 minutes in an ice water bath. 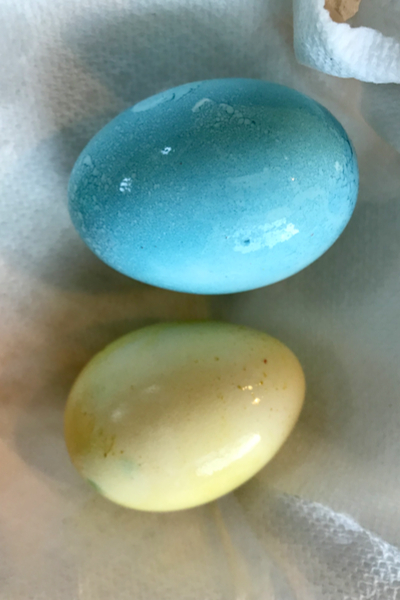 The result – perfectly colored Easter Eggs! And somehow that mysterious oval spot never happened. The entire eggs was completely covered. So then I began to experiment. 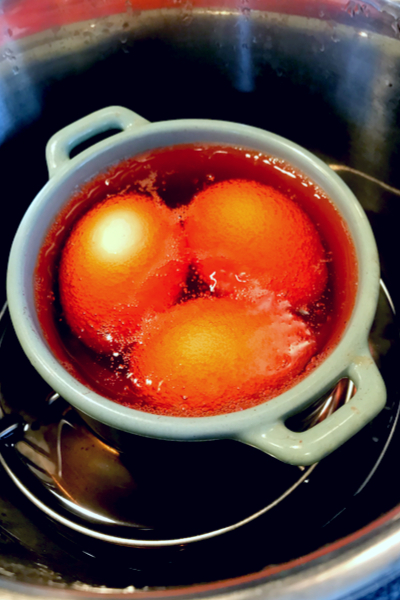 Remove the eggs from the ramekins and place in an ice water bath. I added 3 eggs to a larger dish and the eggs were completely submerged this time. 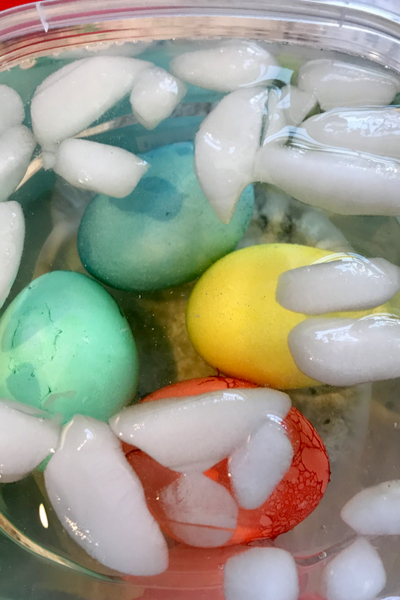 Once the natural pressure release time expired, I transferred 2 of the eggs to the ice water bath and the other one into dish filled with half ice water and half of the dyed water. I let them soak for a good 45 minutes, and the one left in the half and half water came out much darker than the other two. After you remove the Easter Eggs from the ice water bath, let them dry completely before handling. It was a fantastic way to get a variety of colors for the Easter egg hunt! 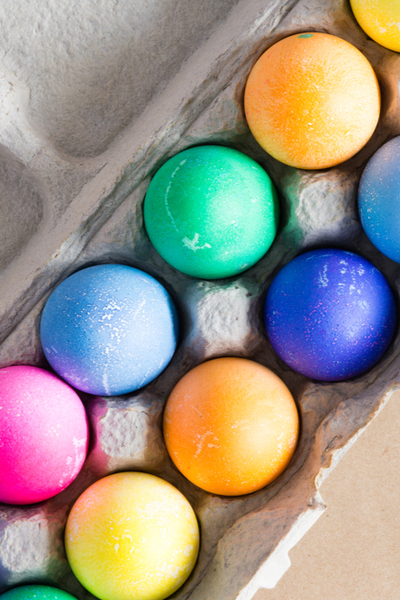 The traditional method of dying Easter eggs taken to a new level – coloring Easter eggs while they cook! In the liner of your Instant Pot add the trivet and 1 cup of water. 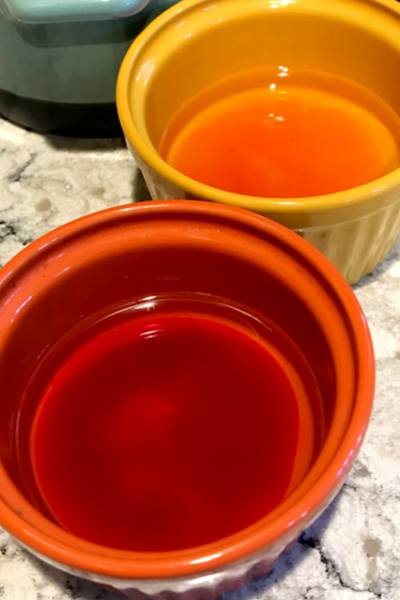 In each ramekin add 3 tablespoons of vinegar and 10 drops of food coloring. Stir. Place an egg in each ramekin and add enough water to cover the egg. Place filled ramekins in the Instant Pot. It is okay to stack them as long as the lid is able to be locked. Pressure cook/Manual on HIGH pressure for 5 minutes. Once the cooking time expires, allow for Natural Pressure Release for 5 minutes and fill a large bowl full of ice water. Release any remaining pressure. Immediately transfer eggs to an ice bath to stop the cooking process. After 5 minutes in the ice bath remove the eggs with tongs and allow to dry. *If you want a deeper color, add the eggs to a mason jar with half ice water and half of the dyed water that the egg was cooked in.